Military trained as IEBC poll officials as ordered by Jubilee Government in Preparation for Votes Rigging. - Bana Kenya News, Real African Network Tubanane. Home featured Military trained as IEBC poll officials as ordered by Jubilee Government in Preparation for Votes Rigging. Military trained as IEBC poll officials as ordered by Jubilee Government in Preparation for Votes Rigging. NASA Presidential Candidate Raila Odinga accuses Jubilee of dragging the military into politics; claims several KDF soldiers are being trained for recruitment as polling and presiding officers to help rig the August General Election and over 100 KDF men have already been deployed to Kakamega county ahead of the NASA tour of western regions. "The attempt to involve the Military and the training is managed by the RTD General Julius Karangi and the plan was developed by the NIS and we have evidence." Said Odinga. Speaking in Kajiado, Raila Odinga said that they have evidence of the Jubilee ill-tricks and their days are numbered. 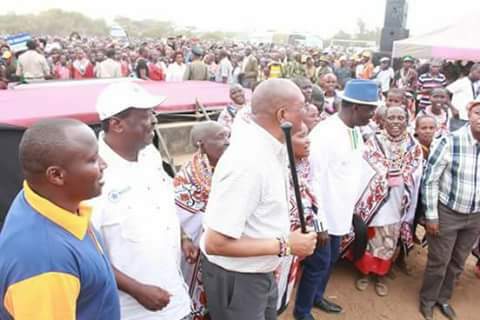 He added that the statements he made last time regarding the Maa community land will not be withdrawn because President Kenyatta said the same in Kiambu when he was issuing title deeds. He added that the community should not sell the remaining land. "What makes them so special that they are only recruiting soldiers instead of young Kenyans who are jobless? Will they repel all voters from all polling stations? " Said Siaya Senator James Orengo. "We want to appeal to the military to remain faithful to the traditions of this country and refuse to be used and dragged into politics. We have discovered that Military personnel are being prepared so as to be used by the IEBC as polling officials in the on-going recruitment process. The training is done at Embakasi barracks and we have evidence. " Says Raila Odinga.